Our design behind this challenge is to see the beauty or the scares that come in the dark. I love the idea of fireflies and stars, plus after watching COCO with my kids, I have a newly infused love of the Day of the Dead and my ancestors. I have a few pieces I am working on this month, here is a peak at some elements I am blending in with embossing powders of course. This one will be featured October 8 for the Magical Mysteries Blog Hop Featuring the Rita Barakat Line of Embossing Powders. Congratulations to Drea Slee of Drea's Scraps of Inspiration AND Gail of Crafty Nomad. Winners of the Leaves of Change Dare. 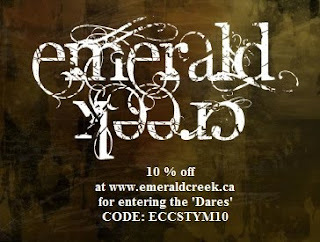 Please email Katelyn at info@emeraldcreek.co for your prize code. Thanks so much for the win! Looking forward to your project, and the blog hop!